The ruin of Kilchurn Castle at the banks of Loch Awe with the green hills of Scotland in the background below a blue sky with a lone white cloud. 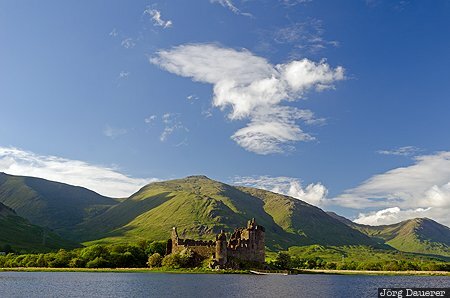 Loch Awe is in Scotland, United Kingdom. This photo was taken in the evening of a sunny day in June of 2013. This photo was taken with a digital camera.